The Cincinnati Bengals’ 2019 regular-season schedule was released Thursday night by the National Football League. The team’s preseason schedule also has been finalized. Single-game tickets for all home games are on sale now (see information below). 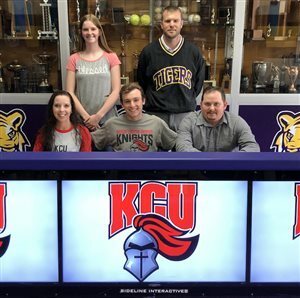 McClain senior Colton Mossbarger signed a letter of intent Wednesday to attend Kentucky Christian University, where he will be playing collegiate football. 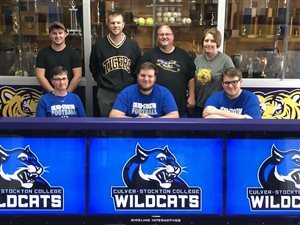 McClain senior Trevor Tite signed a letter of intent Wednesday to play football at Culver-Stockton College. The Cincinnati Bengals will play the Los Angeles Rams on Sunday, Oct. 27 at Wembley Stadium in London. The game will kick off at 1 p.m. Eastern. The full regular-season schedule will be released at 8 p.m. Wednesday. Grammy-nominated singer, songwriter and storyteller Jeremy Camp will play a post-game concert presented by Prasco Monday, Sept. 2 following the Cincinnati Reds vs. Philadelphia Phillies game (2:10 p.m.) at Great American Ball Park. The Whiteoak Wildcats baseball team earned a Southern Hills Athletic Conference victory on Friday, April 12 by defeating the Fayetteville Rockets, 11-0 at FHS. The McClain Lady Tigers earned two wins this past Saturday (April 13) by defeating the host Paint Valley Lady Bearcats by scores of 8-1 and 15-5.